If canoeing at Kluskoil Lake, watch out for Chine Falls flowing out of the lake, near the campground. This park was burnt over by the 2017 wildfires. With the exceptions listed below, the park has now been reopened. The Nuxalk-Carrier Grease Trail is closed from the 104 km mark to the western boundary of the park (114 km mark). This closure is due to fire damage sustained in the 2017 fire season and is to ensure visitor safety. 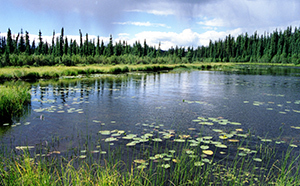 Kluskoil Lake Park provides a variety of recreational opportunities, and protects valuable wildlife habitat in Sub-boreal Pine-Spruce forest and wetlands. The Alexander Mackenzie Heritage Trail travels (through Kluskoil Lake Park) from Quesnel to the Bella Coola Valley along the Blackwater River and over the Rainbow Range in Tweedsmuir Park “In the Steps of Alexander Mackenzie” is a trail guide published in 1987, available through bookstores, museums. The park may be inaccessible in the spring and early summer due to high water levels at the upper crossing of the Euchiniko River, and at various creeks along the trail. The park is located 100 km northwest of Quesnel. To get there, travel 10 km west on the Nazko Highway to the Bouchie Lake School. Turn right onto the Blackwater Road until it joins the Batnuni Road. Follow the Batnuni Road, and turn off to the left at the 108 km mark. This track will lead to the upper crossing of the Euchiniko River (at the south end of Titetown Lake). This crossing is several feet deep most of the year, and even higher during spring runoff. From here one can travel 18 km to Kluskoil Lake on the Alexander Mackenzie Heritage Trail by foot, horseback, mountain bike, ATV or high clearance 4x4. Kluskoil Lake can also be accessed by float plane. Check the aircraft charter companies in Prince George, Nimpo Lake and Williams Lake for more information. Kluskoil Lake is a wilderness park; it is recommended that the trail guide and 1:50,000 NTS maps are purchased before planning a trip. The following maps cover the park and are available through Maps BC: 93 G/4 – Coglistiko River; 93 G/5 – Pelican Lake; 93 F/1 – Susha Creek. History: Kluskoil Lake Park was established as a protected area under the Cariboo-Chilcotin Land Use Plan and designated a Class A park in 1995. Cultural Heritage: The trail we now call the Alexander Mackenzie Heritage Trail has been used for centuries by the Nuxalk, Carrier and other aboriginal peoples as a major trade and travel route. Eulachon oil from the Pacific Coast was rendered and carried in cedar boxes along this route, often referred to as the Grease Trail. Dried fish, cedar-bark and berries from the coast were also traded for moose hides, beaver and obsidian from the interior. Many aboriginal people from the Southern Carrier Nation lived seasonally along sections of the trail and continue to do so today. Archaeological research has identified prehistoric sites near or on the trail, with evidence of stone tool use or manufacture and recognized heritage values that go back thousands of years. Members of the Southern Carrier Nation guided Alexander Mackenzie on this trail in 1793, during his search to find a trade route to the Pacific Coast for the Northwest Company. Mackenzie was the first European to cross North America. Kluskoil Lake Park encompasses only a short portion of the Heritage Trail. Mackenzie and his party of nine men camped in what is now the park, beside the Blackwater River west of Kluskoil Lake, on July 8th, 1793. Conservation: A very rough road runs through the park and sections of it travel over the Alexander Mackenzie Heritage Trail. This trail is protected as a historic site under the Heritage Conservation Act. Motor vehicle access is permitted up to the park’s western boundary. Please stay on the road if travelling in a vehicle or ATV. The trail is managed by the Forest Service outside the park. The park supports numerous wetlands in a rolling landscape, and contains important habitat for moose, fisher, lynx, and aquatic furbearers. It also encompasses two small untouched watersheds that are representative of the region. The Blackwater (West Road) River, its tributaries and Kluskoil Lake support a high diversity of fish species. The Blackwater River is designated as Class II Classified Waters. Please check the BC Freshwater Fishing Regulations Synopsis for more information on licensing requirements. Wildlife: Hunting is permitted in Kluskoil Lake Park from September 1st to June 30th. Please check the Hunting and Trapping Regulations Synopsis for more information. The Blackwater River is not recommended for canoeing; however, canoeing on Kluskoil Lake will provide access to wetlands and wildlife viewing opportunities. The Blackwater River and Kluskoil Lake support significant populations of rainbow and bull trout. The river system is designated a Class II Classified Water. Anyone fishing or angling in British Columbia must have an appropriate licence. The Alexander Mackenzie Heritage Trail travels (through Kluskoil Lake Park) from Quesnel to the Bella Coola Valley along the Blackwater River and over the Rainbow Range in Tweedsmuir Park. “In the Steps of Alexander Mackenzie” is a trail guide published in 1987, available through bookstores, museums. Following the Batnuni Road to the upper crossing of the Euchiniko River, one can travel 18 km to Kluskoil Lake on the Alexander Mackenzie Heritage Trail by horseback. The park is open to hunting. Please check the BC Hunting and Trapping Regulations for more information. This park only has pit toilets which are located at the rustic campground on Kluskoil Lake. There are no flush toilets. Wilderness, walk-in camping is allowed, but no facilities are provided except 3 small treed sites at Kluskoil Lake and an information shelter map and signage. The park is open year-round if accessible.